Android, the versatile open-source operating system people love hacking onto devices it's not supposed to be on, has now been put on a calculator. 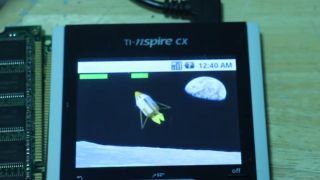 The device in question is a TI-Nspire CX "graphing handheld", so it's already equipped with a colour display and digital smarts greater than your generic number cruncher. In fact, at school a graphic calculator was the closest we got to a gaming device in class - you could certainly draw some giggle-inducing shapes on the graph. Josh Max, the man behind the hack, posted a video of the device in action where he manages to play an Android game on the calculator's 3.5-inch, 320 x 240 display. At around $130, £110 you can buy full fledged Android smartphones for less that the Nspire CX, sporting a much newer version of Android than 1.6 Donut - but then again they're not a graphic calculator. Check it out in action below - and yes, the calculator app does work.